The call for entries for FotoFilmic’16, the 4th annual juried film photography competition and traveling exhibition program, is now open to all photographers worldwide shooting film or using analog processes. FotoFilmic’s core intention is to open wide the publication doors of contemporary film photography to all talented amateurs without restriction of ages or nationality demonstrating high quality of execution and creative envisioning. The 2016 Competition includes a $1,500 Award + 4 other Cash & Equipment Prizes + Exhibition Catalog publication. A total of ninety (90) photographers will be selected and published in three (Winter, Spring, Summer) shortlist calls. Five jurors will pick thirty (30) winners for exhibitions in three different cities and countries. The FotoFilmic’16 show will start in Los Angeles, California, USA in November 2016, then push south across the Pacific for a second instal in Melbourne, Australia in February 2017, and finally come back home to Vancouver, Canada in April 2017 for a third concluding act. 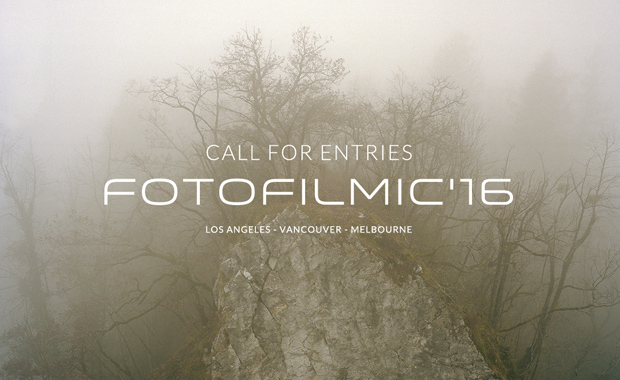 FotoFilmic was founded in 2012 in Vancouver, BC, Canada as a global film photography competition and publication & curation platform dedicated to emerging and unknown photo talents attached to film and analogue practices worldwide.